Keynote address introduced by the AIDLR Secretary General Dr. Liviu Olteanu, at the OSCE/ODIHR held in Warsaw, on 19 of September 2017, regarding "A Special Attention to the Protection of Human Rights, Fighting Terrorism, the Right to a Fair Trial and Democratic Law-Making"
O.S.C.E. (ORGANIZATION FOR SECURITY AND COOPERATION IN EUROPE) Warsaw, Sep 19, 2017. 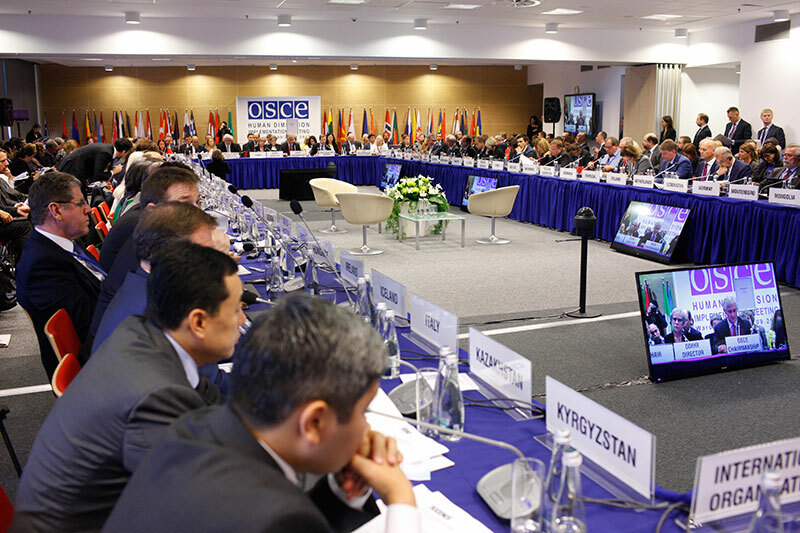 The following statement was issued by Dr Liviu Olteanu in Warsaw at the OSCE in the context of the topics debated by the OSCE’ Member States and other stakeholders on « working sessions 12 and 13 » regarding « Fighting Terrorism » and « Right to a Fair Trial ». According to OLTEANU, « today more than ever, the people are challenged in their daily life with the issue of insecurity, persecution and torture, terrorism and international crisis. Many times the concerned issues are hate speech, religious hatred, discrimination of religious minorities and its followers, right of a fair trial, or violence that can affect directly the religious minorities ». In the last months, have been organized interested international conferences on “prevention of incitement to violence and prevention of genocide”, “pacific coexistence” and “hate speech and security”; the first meeting has been hosted in July 14, 2017 at the UN Headquarters in New York where the Secretary General of the UN, ANTONIO GUTERRES, and the Under-Secretary-General Special Adviser of the UN Secretary General on Prevention of Genocide ADAMA DIENG, launched the “Plan of Action for Religious Leaders and Actors to Prevent Incitement to Violence that Could Lead to Atrocity Crimes”. GUTERRES mentioned at that historical event that: “Around the world we see the religion how is manipulated to justify incitement to violence and discrimination, and an alarming rise online and offline of hate speech messages that spread hostility and hatred and encourage populations to commit violence against individuals or communities often based on an identity. Hate speech seeds suspicion, mistrust and intolerance”. The second event has been hosted in Ft. Lauderdale Florida USA and organized by the International Religious Liberty Association (IRLA) and the Headquarters of the Adventist Church on “Religious Freedom and Hope for Peaceful Co-existence”. One of its resolution included a commitment to “encourage national and international actors to avoid stereotyping of any groups or individuals based on prejudices, preconceptions, or assumptions;” and also to “encourage religious and other leaders to recognize the danger of religion being hijacked and misused for non-religious goals”. The third international conference on “Security and Hate Speech” has been organized ‘Under the Auspices of Italian Presidency of G7’ by Consiglio Nazionale Forense CNF; the President of CNF Andrea MASCHERIN stressed on “the necessity that international actors, specially the lawyers and every national Bar of Laws - starting with the G7 - to join their efforts on working together and taking attitude for human rights and security, and against hate speech. In the context of the topics debated at the OSCE in Warsaw on 19 of September 2017, on “Fighting Terrorism” and “Right to Fair Trial”, the AIDLR Secretary General, Dr. OLTEANU proposed to the OSCE’ Member States, due to the alarming growing of international insecurity, extremism, terrorism and populism, must focus their special attention on getting solutions at the forward issues: 1) Tackling societal root-causes: discrimination and equality, racism, negative stereotypes and prejudice, lack of prudence and populism and utilization of religion for political gains; 2) Members States to be encouraged regarding integration and respect for differences of every human being while respecting one’s own cultural identity, in this way will be discouraged the hate speech, religious hatred, violence, discrimination of all people, that specially affect the religious minorities; 3) To combat stereotypes, it should only be restricted through criminal offences following the principles of legality, proportionality and necessity; 4) Member States to have a clear separation between the political and spiritual aspects, condemning the repressive and arbitrary laws on discrimination based on religion and cultural identity. Also, the secular countries to be prudent on the religious expressions and signs that may be restricted without a clear public interest justification and end up negatively affecting the enjoyment of other rights as well; 5) Member States to be monitored not to use ‘extremism’ and ‘national security’ as multipurpose tool and pretext or political abuse against religious groups and minorities, dissidents and political opponents”. As a conclusion of his statement, OLTEANU underlined: The governments do not discriminate journalists, social media, religious or beliefs minorities, and not to manifest discrimination, intolerance and persecution against the persons due to freedom of conscience, and to give a special attention to the ‘right to a fair trial’ a every human being, respecting the dignity of every person.